I planted my own broad beans back in February full of anticipation and excitement for that day when I could finally snap the pods from the plant, lightly cook them and enjoy them just as they are. To say I was jealous of the broad beans at the farmers’ market is an understatement. I couldn’t possibly buy any and cheat on my home grown ones…could I? Some of my broad beans are at the mangetout stage and I enjoy the occasional one immensely straight from the plant. They’ve a bit more growing to do before I can make my broad bean houmous. Until then the big, fat, shiny green beans from the farmers’ market will keep me going. One of my favourite things is popping the broad beans out of their fluffy pods. I love the smell. I used around 20 pods if not a few more to get enough beans for this meal. The more the merrier I say. Once all the beans are extracted, boil them in salted water for about 4 minutes. When done, drain the beans and you can begin one of the most satisfying pursuits imaginable. Squeeze the beans out of their grey, papery cases. Some will come out easily with just a small pinch whereas some require the insertion of a fingernail to get things moving. You’ll end up with a mound of bright green beans that can’t fail to cheer you up. To go with the beans, boil some new potatoes until cooked and fry some bacon – I managed to use some collar bacon which cooks so beautifully. Broad beans happen to come out at the same time as mint in the garden. It just so happens that they are excellent partners together. To make a summery, fragrant mint dressing you’ll need: small handful chopped fresh mint, good glug of olive oil, a little white wine vinegar, a small crushed garlic clove and salt and pepper. For this particular dressing I used 3 parts oil and just less than 1 part vinegar. If you’re getting the mint from the garden, be careful to wash it first. Having an insect in your meal is extra protein that no one is likely to appreciate. 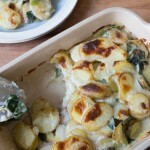 Put the potatoes, bacon, broad beans and dressing together in a bowl. This is one of those meals that is equally good hot, cold or luke warm. I threw a few chopped spring onions in at the end too. The first broad bean meal of the year means one thing to me, Summer is just round the corner. Looks damn good, and so easy to make. I see you are a “to pod” like myself sort of person. To me it’s the bacon that really atracts me to this dish. Looks delicious. Looks fab and the collar bacon sounds perfect. so much more taste than back bacon. Gorgeous! Broad beans and mint scream summer which is just about to start around here as well! 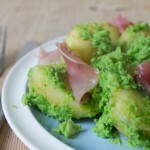 Broad bean, mint and bacon is the ultimate summer combination – will have to buy myself some beans today and get podding! 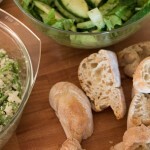 I often add a little crumbled feta to a salad like this too – and mop it all up with crusty homemade bread. Thanks for the inspiration! Glad you all enjoyed it. Hope you get hold of some broad beans soon!